The Cellist’s and Violinist’s EEG pulse and brain signals figure against the Baroque Basso Continuo that they are playing. They each wear a state of the art wireless Enobio EEG system made by Starlab that transmits EEG, ECG and EOG from brain activity, pulse, and eye movements to 2 laptop computers. These signals are mapped into sound in real-time with specially designed sonification algorithms. The concert piece is composed by a live mixing of the music they are playing with the sonification of the spontaneous signals of their bodies and brains. This work premiered in a curated concert at the University of Pompeu Fabra in Barcelona on the evening of 22 July during the Sound and Music Computing Conference in 2010. 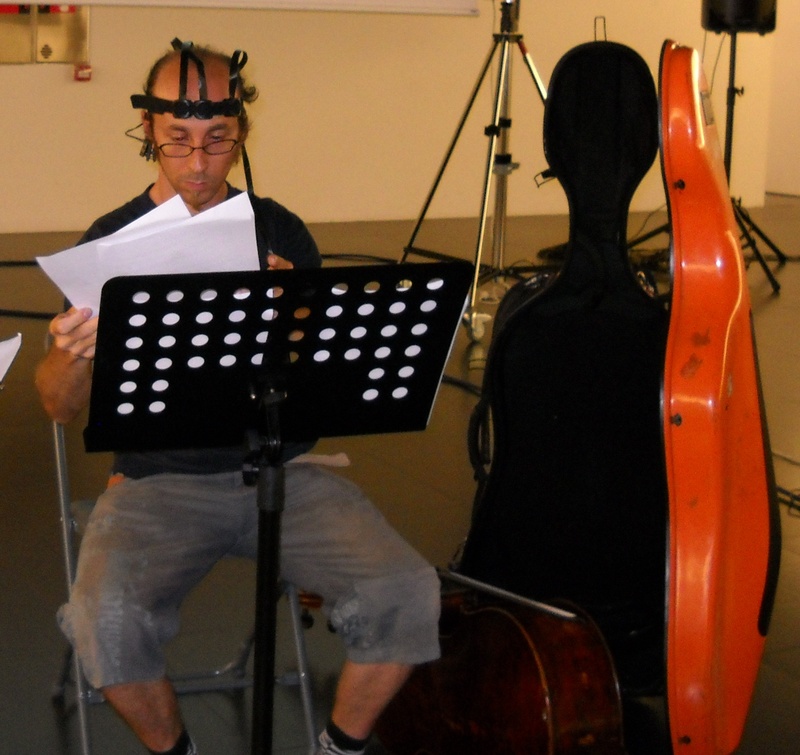 The performance began with an Introduction of Cello and Heart, followed by Violin and Cello with 2 EEGs, and concluded with an improvisation between Cello and Sonified EEG. Here is video of the Introduction. Video courtesy of Tan Ozaslan. Here is an audio recording of the main section where the higher faster heartbeat is Diane playing Violin and the lower slower one is Sasha on Cello. Sasha and Diane chose to play Vivaldi’s Violin Sonata in G Minor, Movement 1. 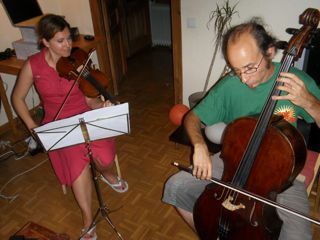 And here is the concluding section which is an improvisation with Sasha on Cello jamming with Stephen on Sonification.